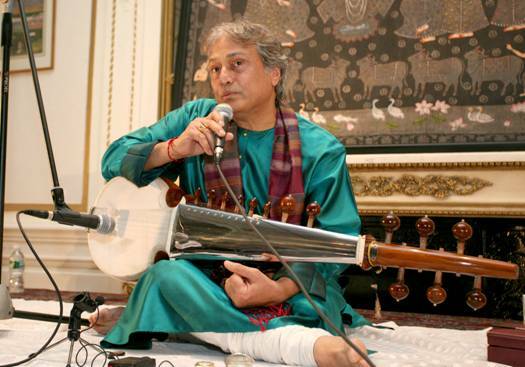 New York, N.Y. Indian classical musician Ustad Amjad Ali Khanplayed the Indian Consulate of New York last week. He played in the grand ballroom of the former mansion on 64th and Fifth, built in 1903 for Ms. Carrie Astor. a warm feeling, and a sense of caring.” – The Dalai LamaIntroduced by the Indian Consul General, Hon. Prabhu Dayal, as part of the Consulate’s Jewels of India series, he was called “India’s greatest diamond.”The musician noted in his opening comments that classical music is a way of life. He dedicated the concert to those who died recently on the Air France plane bound from Rio de Janeiro to Paris, and expressed his heartfelt condolences to their families.The Consulate’s ballroom was standing room only. Khan invited the overflow audience to sit on the stage with him and I joined them, sitting a few feet away. The look of concentration on his face was riveting, so deeply content and at peace. The Consulate’s ballroom was standing room only.I noted Khan’s gray hair set upon a youthful complexion. His turquoise tunic shimmered in the lights as he sang and played such haunting melodies. His eyes shut, his head gently rocking in concentration, he began by demonstrating his instrument. He played with his fingers, and then he played with his nails. The nails producing a sound unworldly in tone. Khan explained how the lack of frets and the tension of the strings make it very difficult to play, as the strings must be pressed hard against the fingerboard. The sitar, by comparison, has frets. The look of concentration on his face was riveting and deeply content.The several hundred people crowded in the ballroom, dressed in suits and cocktail dresses, turbans and saris, sat in awe. Mesmerized, many sat with eyes closed, absorbing the musician’s dramatic presence. The orange, white and green flag of India with its wheel stood proudly next to the stars and stripes. The wheel represents the Buddhist Dharma Chakra (Wheel of Law), with its 24 spokes representing the endless cycle of life. The 19-string sarod has a deep, weighty, introspective sound — contrasted with the sweet, extremely rich texture of the sitar — with strings that give it a resonant, reverberant quality. The gifted musician spoke of two types of music – one of pure sound, and the other almost a language in itself. Charlotte White, a 95-year old denizen of the arts in New York City, lived in India for many years. She praised his “rare, mystical patterns, which so superbly produces such a rich variety of tones. The musician received flowers from Indian Consul General Prabhu Dayal.Following the event, Consul General Prabhu Dayal was extremely pleased, commenting to me, “I am just thrilled by tonight’s performance.” He noted that the concert was part of an on-going series of distinguished artists from India. 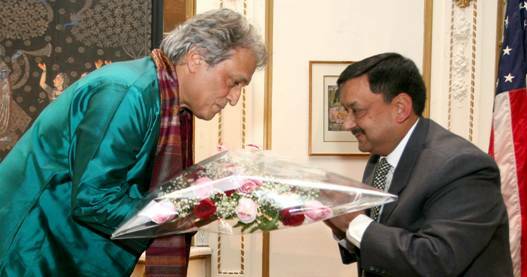 I was able to speak to Ustad Amjad Ali Khan after he finished playing, and asked him what he would like to convey to the American people. The Moslem musician caught me by surprise by switching from the arts to politics. “I was happy this week to see the energy of your president, Barack Obama, and to hear of his dream to unite the word,” he told me. 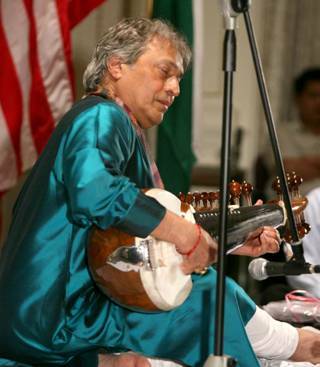 Amjad Ali Khan explained that classical music is a way of life.Khan was a recipient of the UNESCO International Music Forum Award, UNICEF’s National Ambassadorship, and The Crystal Award from the World Economic Forum. He was also awarded the Fukuoka Asian Culture Grand Prize. His wife and two children, Ayaan and Amaan, were with him in New York. Both Ayaan and Amaan play the sarod, and a family concert may one day take place. I spoke to his youngest son, Ayaan Ali Bangash. I asked Ayaan, now 30, about living and training with the world’s greatest sarod player. 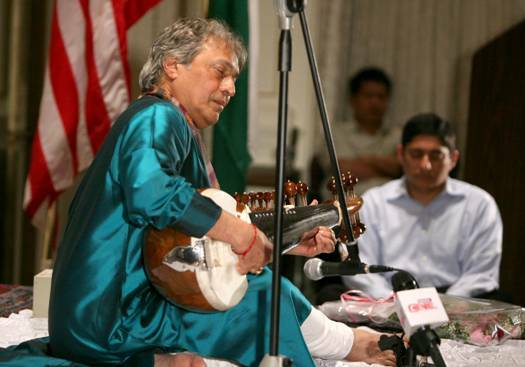 At 63, Amjad Ali Khan comes from a long line of distinguished musicians. He was taught by his father, Hafiz Ali Khan, a musician to the royal family of Gwalior. Khan is the sixth generation inheritor of this lineage. His ancestors have developed and shaped the instrument over several hundred years. 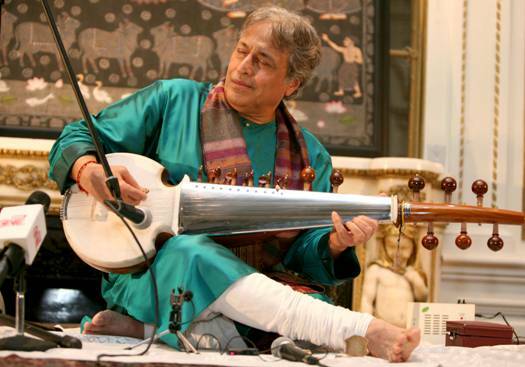 His forefathers came in the mid-1700’s from Afghanistan to India’s relaxed music atmosphere and brought the rabab, a string instrument that which later developed into the sarod. 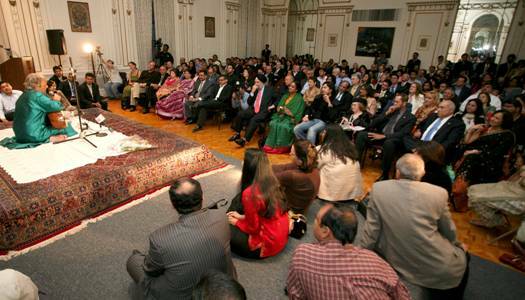 Amjad Ali Khan’s concert was sponsored by New York Life, which has a large number of Indian and Indian-American clients. New York Life frequently highlights Indian culture in its advertising campaigns and is a generous corporate patron to the arts. All Photographs courtesy of Gunjesh Desai. Edited by Karen Davis. Published in The Huffington Post, Feb. 2, 2009.